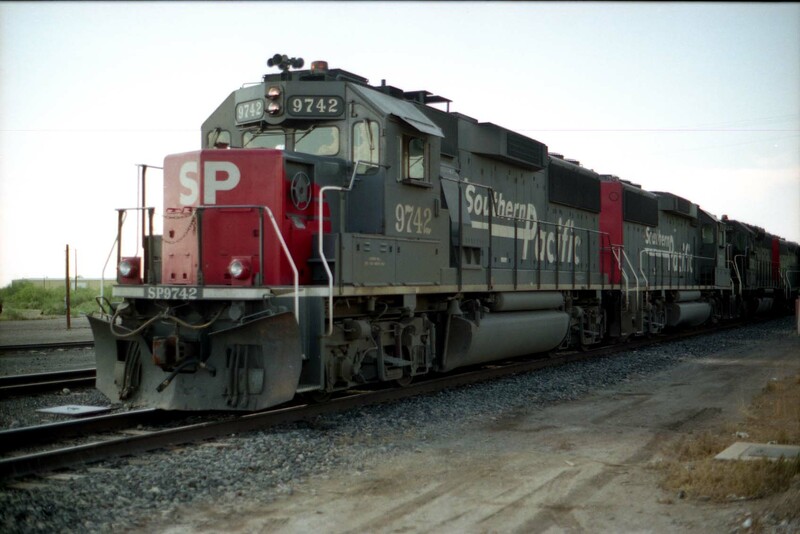 In the 1990s (when I began shooting most of my SP photos), the predominant four-axle locomotive classes were the GP40M and the GP60. As a result, they also dominate my collection of SPL photos. 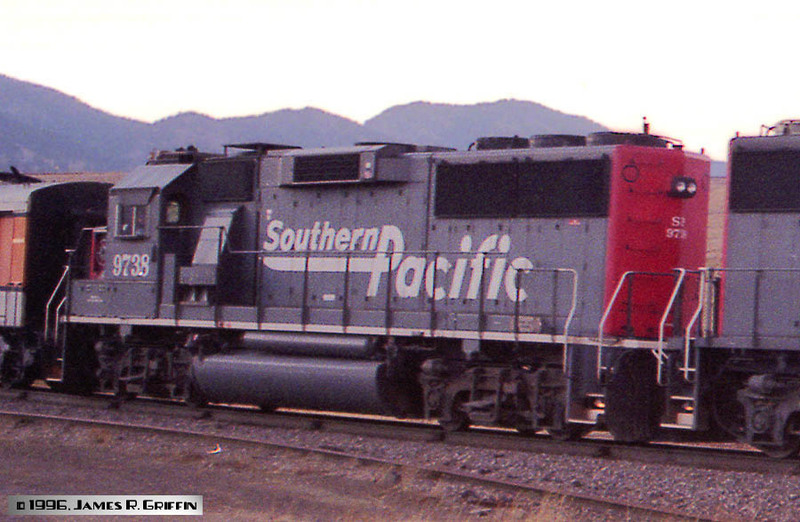 The GP40M’s were older units that were rebuilt by Morrison-Knudsen, arriving on the SPL system between 1990 and 1992. They spanned the transition between traditional SP and SSW paint schemes and the newer, “speed lettering” scheme inspired by the merger with the Rio Grande. The GP60 series also arrived around this time, and as a result we find a mix of old and new paint schemes on those units. On all units purchased after the merger, the headlight arrangement was simplified considerably from the usual SP practice. The red Mars lights and other signal lights were abandoned (and removed from older units). None of the newer units even had lights on the low nose. Instead, amber beacons were installed over the cab. Later, when ditch lights became the norm, beacons were not installed and were sometimes removed from existing units. GP40M No. 7107 is idling at Monte Vista, CO in August 1996 while the crew is at beans (actually, at Pizza Hut). This was the first SP unit to be delivered in Speed Lettering. It’s the experimental, smaller size of lettering. Built October 1971, rebuilt by MK in March 1991. Here’s a GP40M, ex- No. 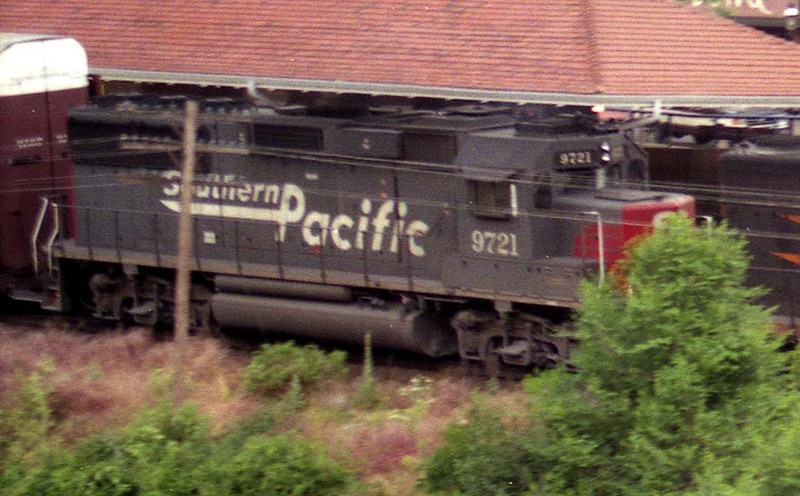 7110, that has survived but with a patch from Union Pacific. Note the smaller-size herald. 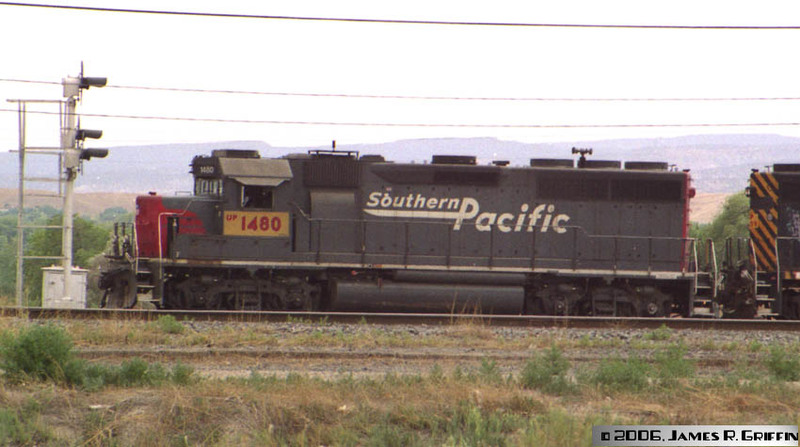 She is seen in the yard at Grand Junction on June 30, 2006, now as UP 1480. Built February 1969, rebuilt by MK in April 1991. GP40M No. 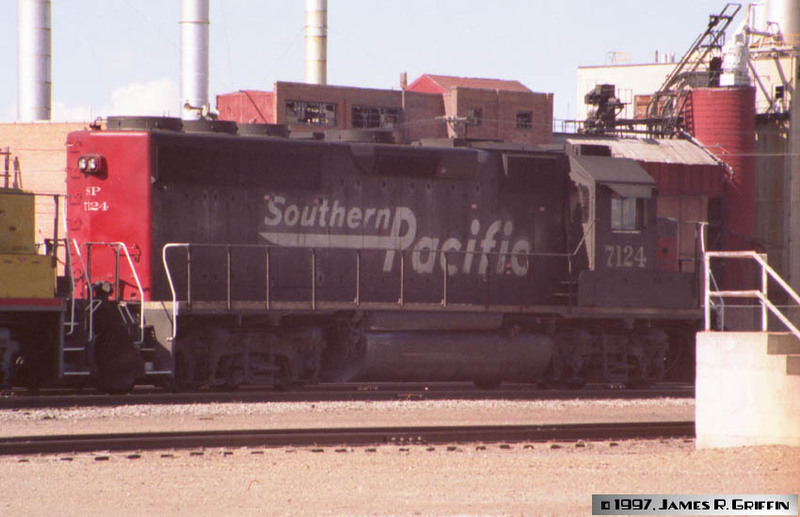 7124 idles at Alamosa in August 1997– not quite one year after the UP merger. 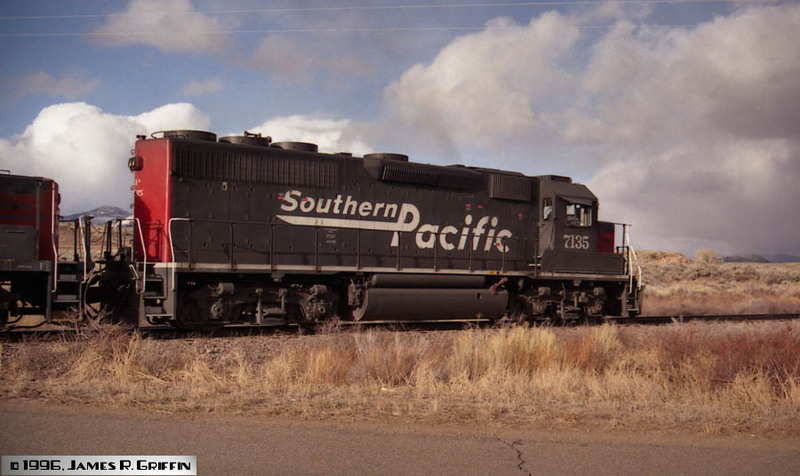 This particular unit operated out of Pueblo for most of the 1990s. Built March 1971, rebuilt by MK in June 1991. GP40M No. 7129. Top: It’s powering the Ski Train on 3/14/93. The train is loading at Winter Park for the return to Denver. 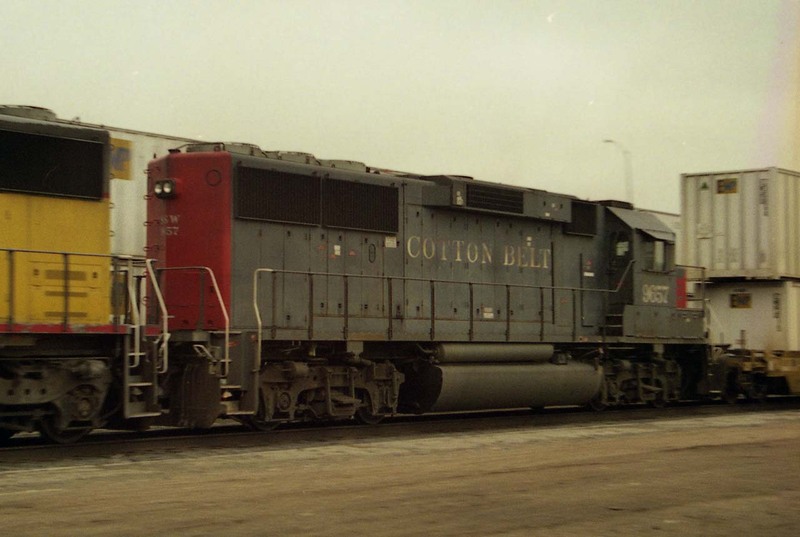 Bottom: Idling in Alamosa in May 1999. Note that it has the smaller version of the Speed Lettering herald. Built April 1969, rebuilt by MK in April 1991. GP40M No. 7135 leads the Alamosa-Pueblo mixed freight on 2/28/1996. Built May 1970, rebuilt by MK in June 1991. SSW GP40M No. 7276 leads the Ski Train on 2/20/1994. When I took this photo the 4-motor unit was laboring mightily to pull the 17-car train by itself, because tunnel motor 8355 had dropped its load about a mile back. Built August 1968, rebuilt by MK in November 1990. SSW GP40M No. 7282, in Alamosa on 3/07/2003. This was taken with a Palm Pilot snap-on camera so I apologize for the low resolution. The 7282 was showing its lack of washings at this point in time. Built August 1966, rebuilt by MK in December 1990. SSW No. 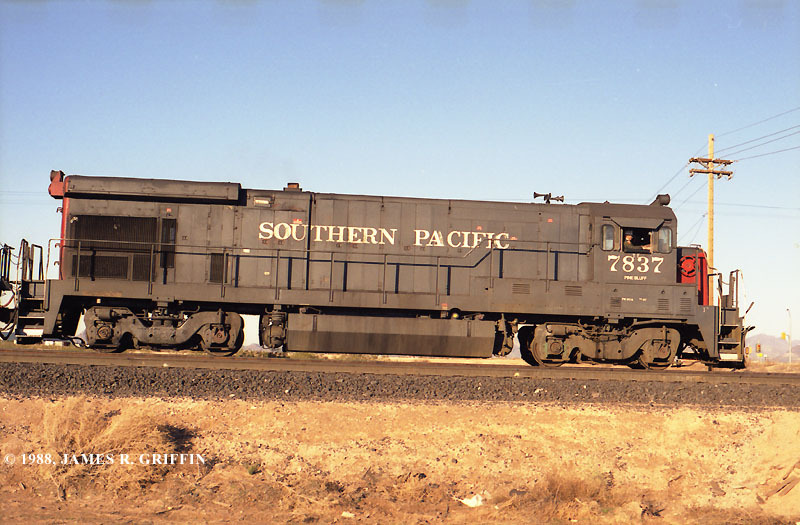 7286 is a GP40M. Top: Here Entering Antonito, CO in March 2003. This is a lot of power for one covered hopper! 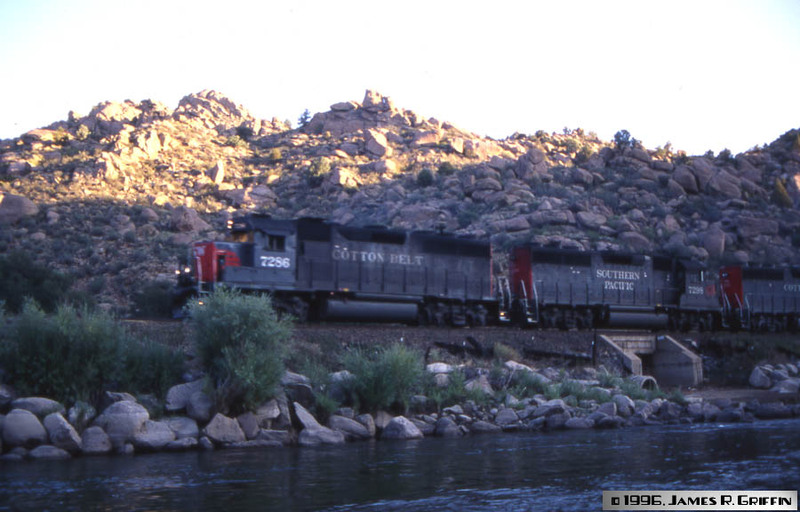 Bottom: She’s leading a westbound manifest on the Royal Gorge line, 8/17/1996. This unit was one of several that were frequently found in the vicinity of Pueblo for many years. Built July 1996, rebuilt by MK in December 1990. Top: This shot of SSW No. 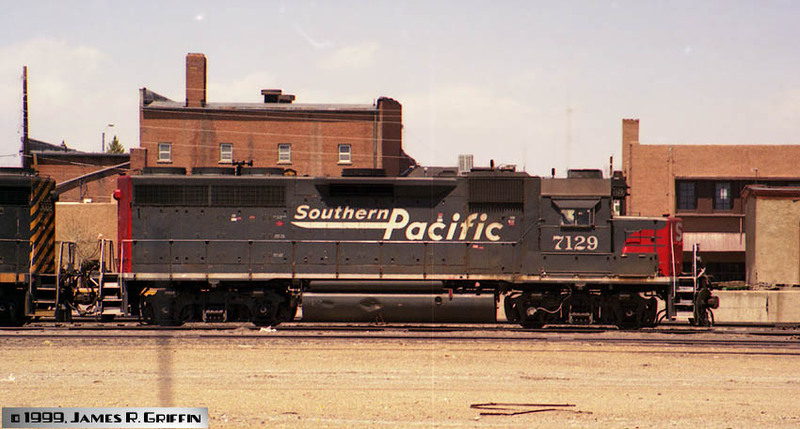 7291 was taken in Grand Junction, Colorado in August 1998. It’s paired with D&RGW No. 3126, a GP40-2. Bottom: SSW No. 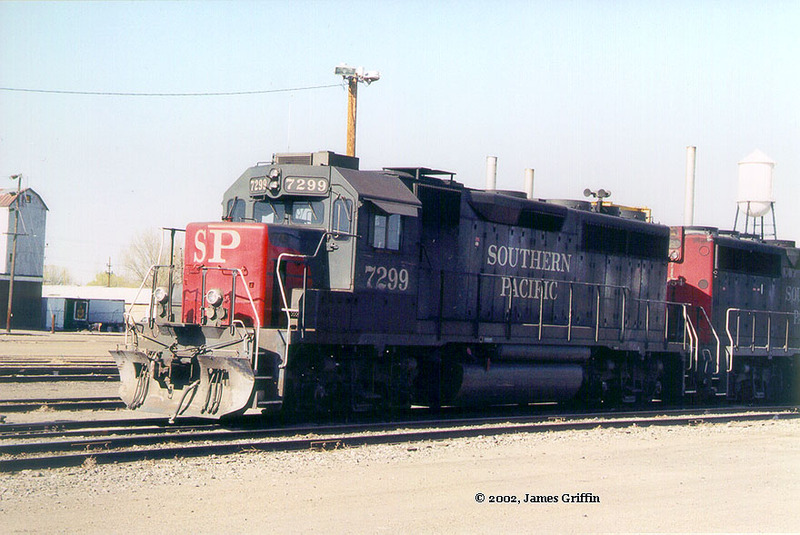 7291 is in Alamosa in March 2003 along with two mates and a pair of D&RGW GP40-2’s.Built September 1967, rebuilt by MK in January 1991. SP No. 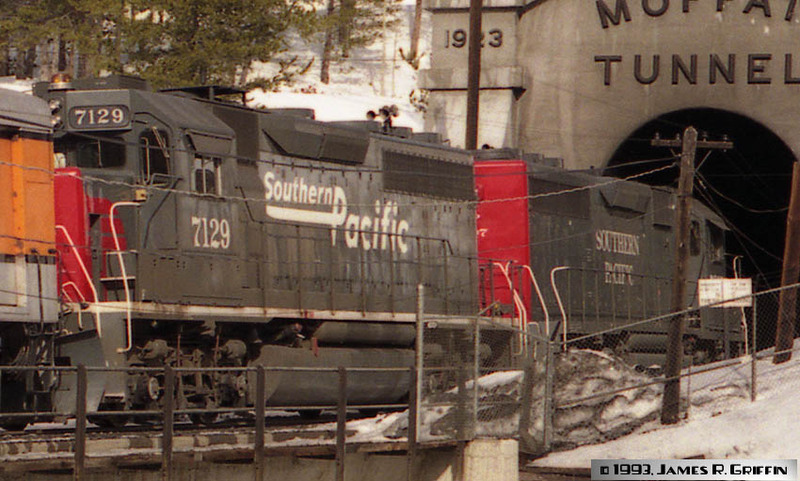 7297 was on the point of the Ski Train on 3/14/1993, paired with No. 7129. Two views. This unit was delivered from MK in 1991, one of the last to come in the traditional SP paint scheme. Built June 1966, rebuilt by MK in February 1991. Built August 1966, rebuilt by MK in February 1991. 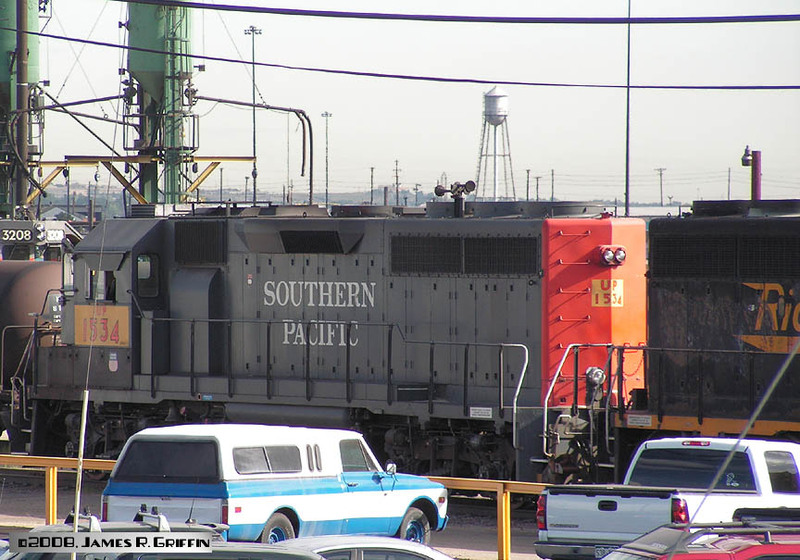 Below: Now patched to UP 1534, she’s in Denver on 9/01/2008. No. 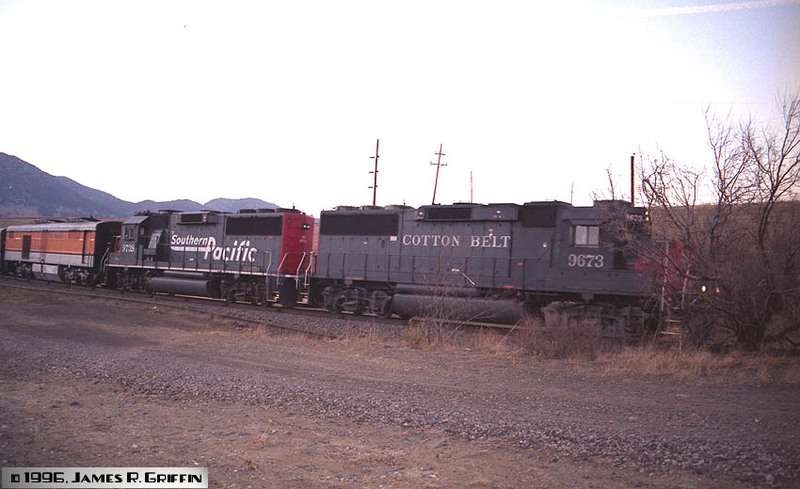 7632 is a Cotton Belt GP40-2. No. 7124 is a GP40M (see above), as is the lead unit, No. 7135. Sandwiched between the two MK units is SP GP40-2 No. 7669. The scene is taken on the west approach of La Veta Pass in Colorado, on February 26, 1996. #7632 Built January 1979. #7669 built March 1980. SP No. 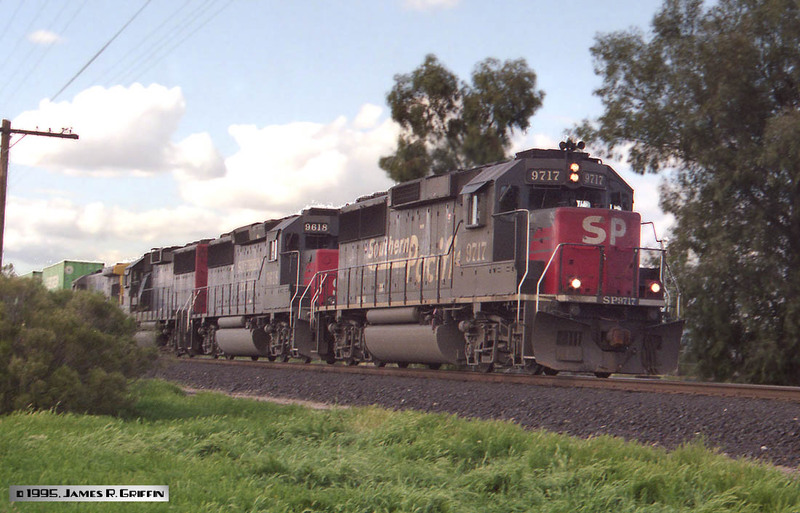 9717 leads an eastbound doublestack train at Tucson on 3/12/1995. Second in line is a GP60 from a previous order (No. 9618)– note the slightly-different dynamic brake blisters. #9618 Built March 1988. #9717 Built April 1991. No. 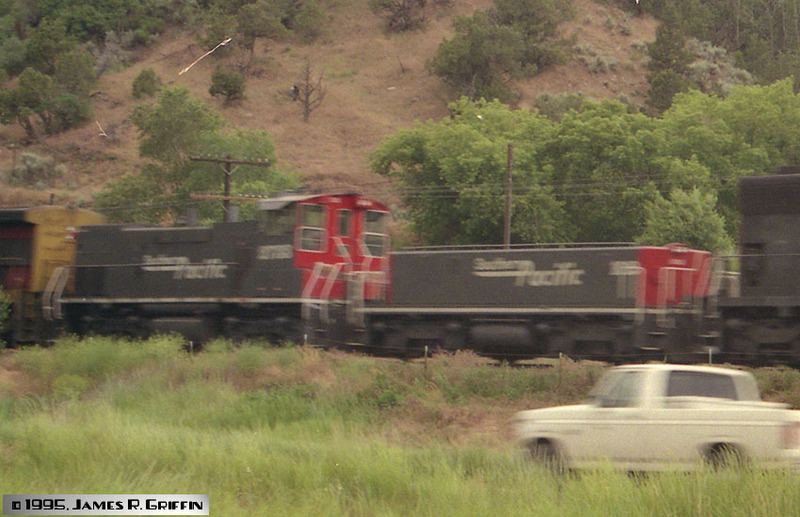 9721 running third, and elephant-style, on a westbound autorack train passing the Glenwood Springs depot on 6/29/1995. Not the greatest photo in the world (actually a detail from a larger frame), it still shows the condition of the unit at age 5 (i.e. in need of a bath!). Top: No. 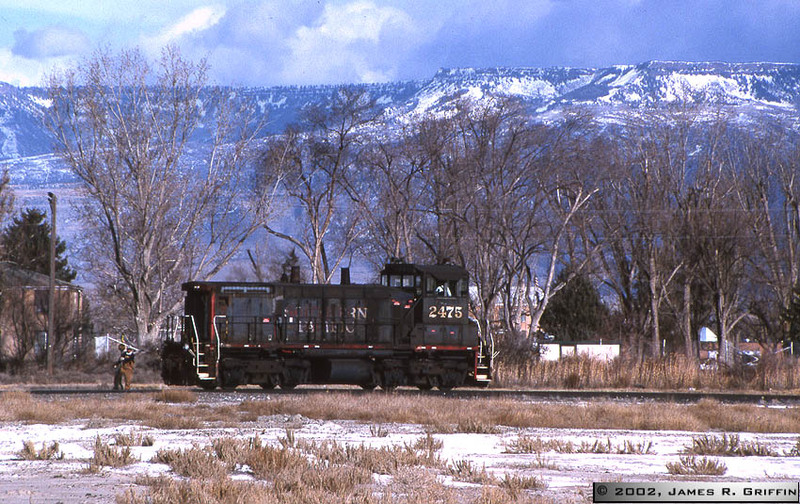 9738, at Rocky Flats on the Moffat line– powering the Ski Train on February 25, 1996. Items of note for such a late date in history include: the horn is still over the cab, and the beacon has not been removed from the cab. 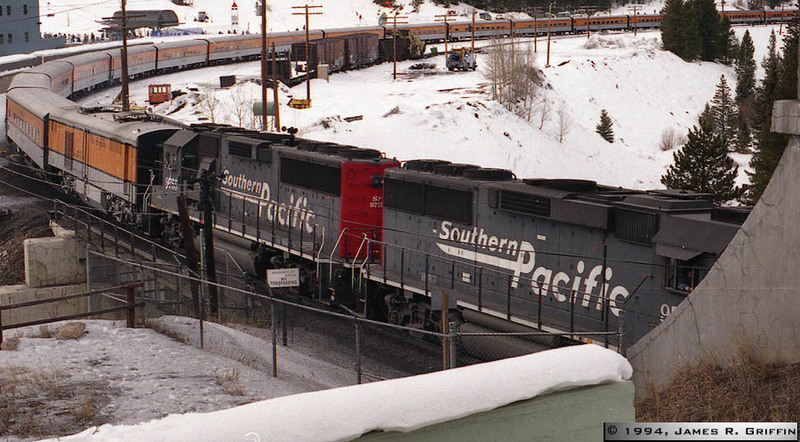 This unit was often around Denver from 1993-96 and made numerous appearances on the Ski Train. Bottom: No. 9738 is running second on a westbound manifest at Cotopaxi on 8/17/1996, three weeks before the UP merger. She’s still pretty clean and shiny (compare to the flank of No. 8321 at left). Detail from a larger image. Built May 1991, and still in original colors in 2013. 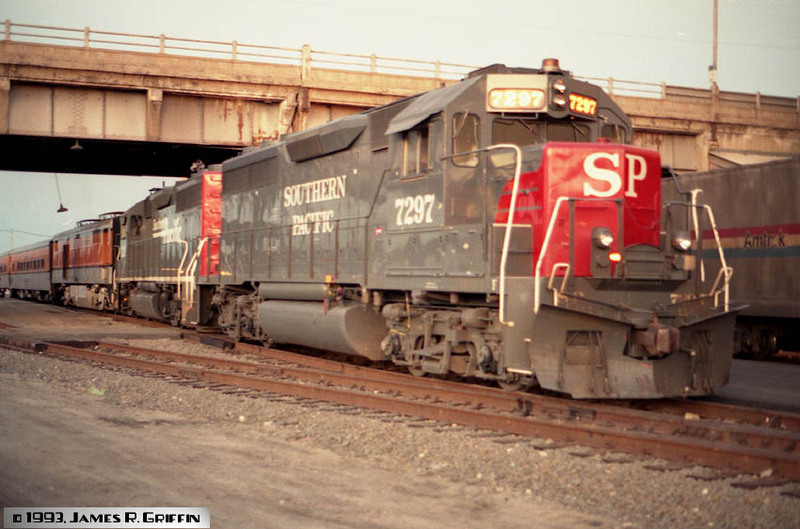 On 12/29/1994, SP Nos. 9752 and 9755 power the Ski Train. Top: The return train is waiting to board at Winter Park. The lead unit always pulled up and stopped right at the west portal of the Moffat tunnel. Bottom: Panorama, stitched together from several shots. Zoom in on this. SSW No. 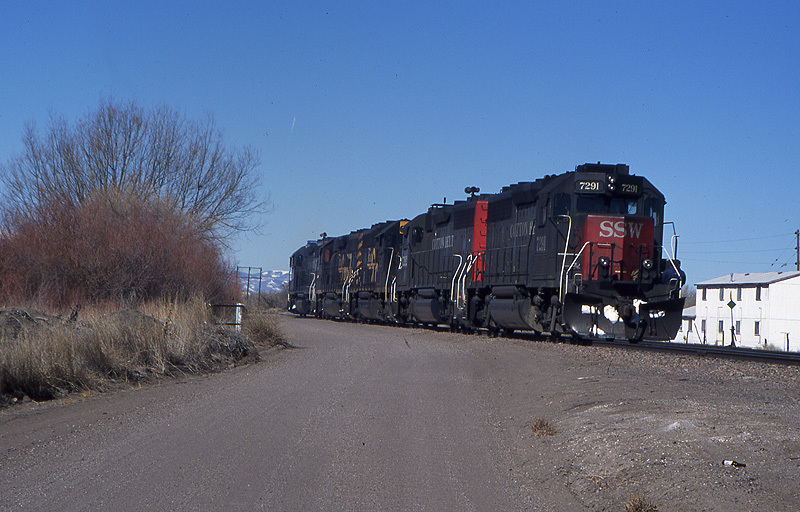 9651 is leading a westbound manifest freight near Buena Vista, CO on 2/18/1994. 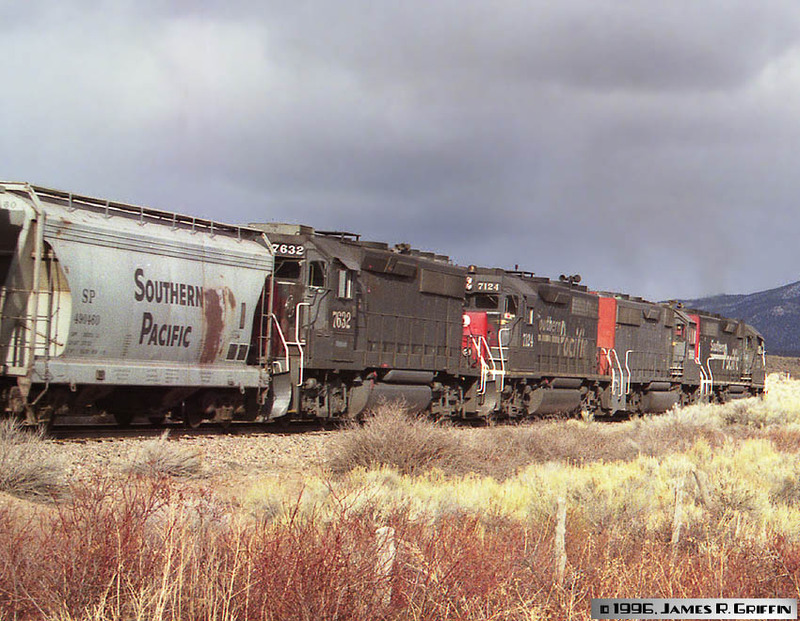 The power was a Heinz mix typical of the period: GP60, GP40M, SD45 in Kodachrome, SD40T-2. Note that the lead unit doesn’t have ditch lights yet (although No. 7124 just behind it does). March 2001, and the Golden State Route is looking very much like a UP possession. It was a treat, therefore, to spot SSW No. 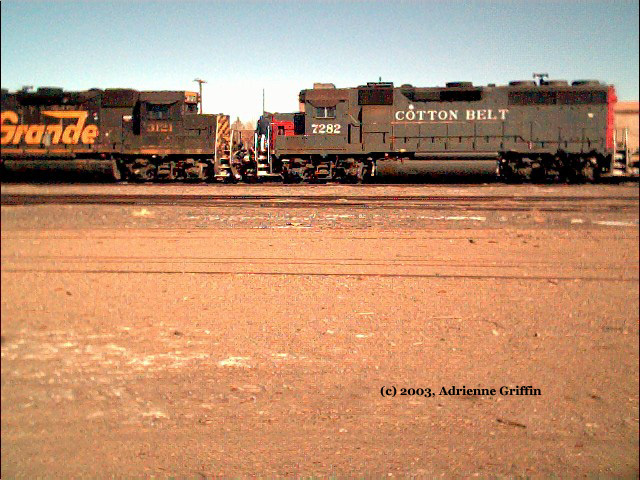 9657 in the mix of this westbound doublestack train at Tucumcari, NM. SSW No. 9673 and SP No. 9738 head up the returning Ski Train at Rocky, west of Denver, on February 25, 1996. 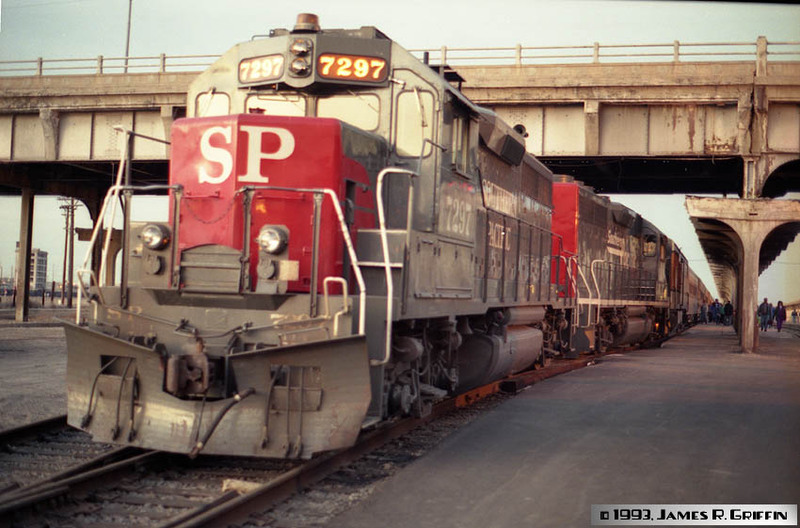 From late 1994 through the 1996 merger, GP60’s in red and gray were the usual power for this train. SSW No. 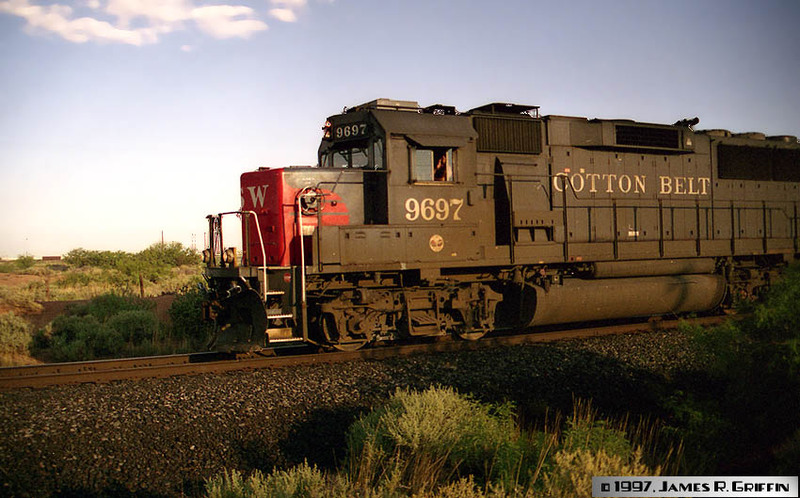 9697 is flying past as it approaches Alamogordo just after dawn on June 25, 1997. The relative speed was such that I led the train a bit too much when taking the photo, but it’s still worth keeping. 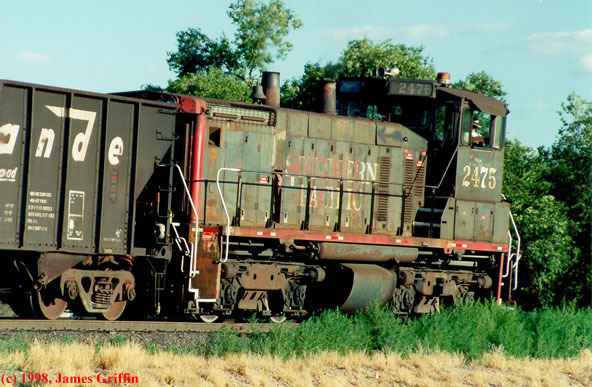 Top: It’s switching a string of hoppers at Grand Junction in August 1998.Bottom: sitting on the wye south of the east yard. This unit was stationed at Grand Junction for many years.Built August 1967, retired early 2006. SW1500 Nos. 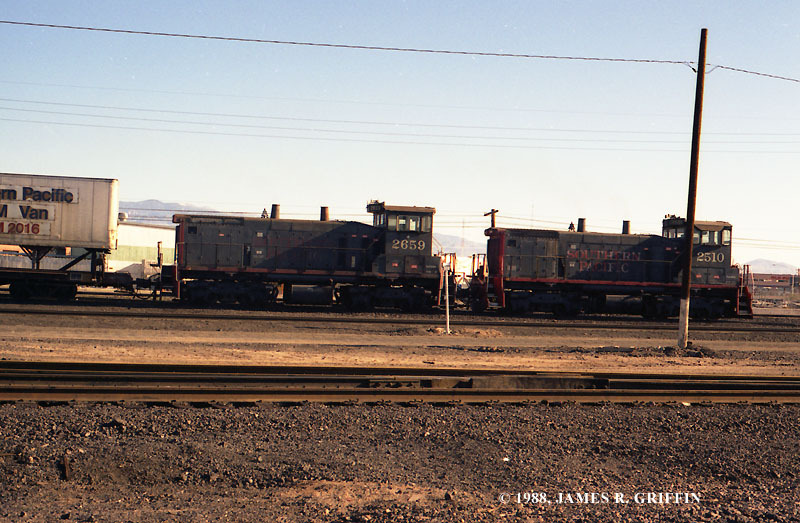 2659 and 2510 switch a recently-arrived pig train at Tucson in February 1988. These units arrived in 1972 and 1968, respectively. #2510 built July 1968; #2659 built June 1972. 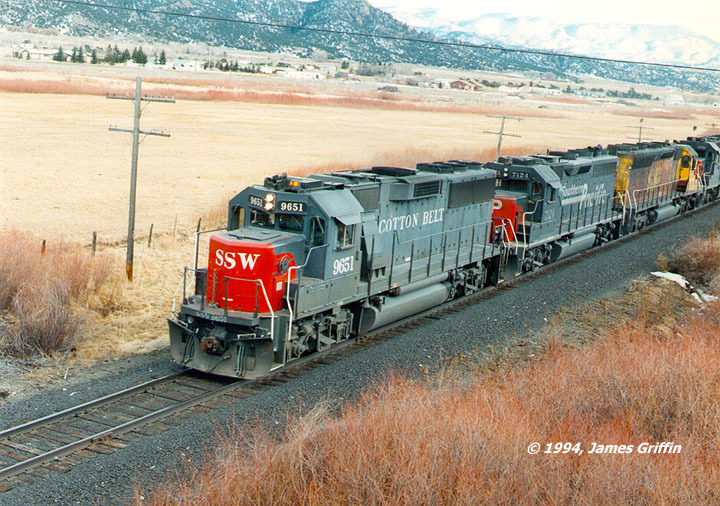 One of the stranger trains I’ve seen was on June 30, 1995 between New Castle and Glenwood Springs, CO. A grimy SD45 led ten units, including this cow/calf pair in shiny new Speed Lettering. The long manifest train was punctuated by D&RGW wide-vision caboose No. 01505! The cow might be MP15AC No. 2738; too much motion blur to be sure. 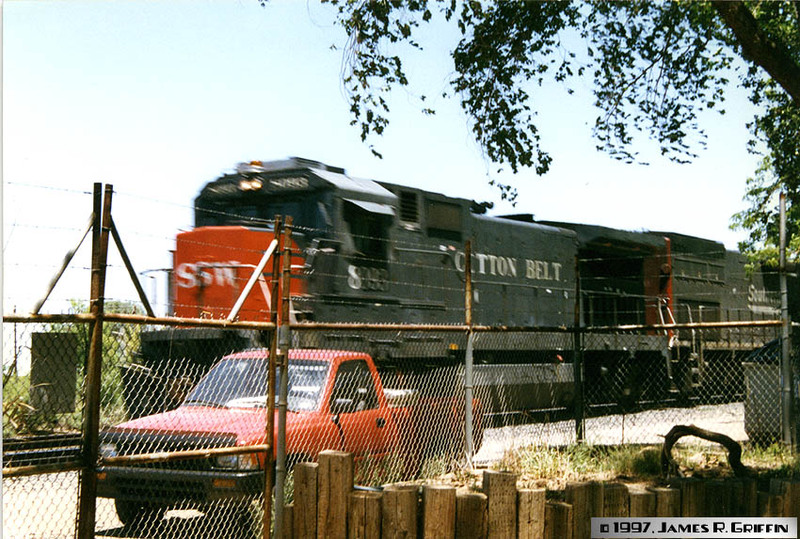 On June 24, 1997, this westbound train roars through Alamogordo, NM. The lead unit is a SSW General Electric Dash-840B; the number isn’t quite readable due to motion blur. I had to climb a fence at the Alamogordo Zoo to get this shot, so the camera wasn’t all that steady… Since it’s my only Dash-840B image, I had to include it here. SP No. 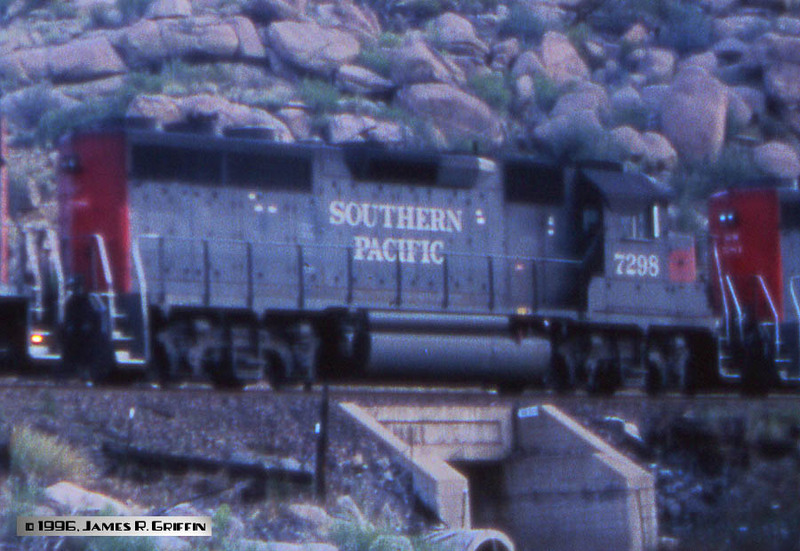 7837, a B30-7, leads a lengthy intermodal train into Tucson from the east on February 5, 1988. It was about 9 years old at the time. B30-7 No. 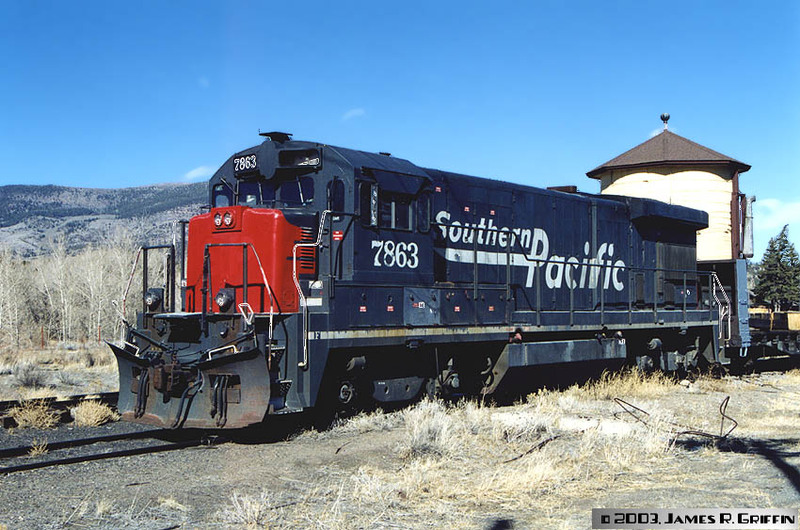 7863 has been sold to the Creede tourist line, where we find it on 3/07/2003 in South Fork, CO. (The tourist line made a notable lack of progress, mostly due to opposition from the citizenry in Creede.) Around 2006, this unit actively worked for the San Luis & Rio Grande, but since late 2008 it’s been parked out in the weeds at South Fork.